As a freelancer, you know that having a portfolio is crucial for getting work. Beginners may be able to skate by without one, but when you’re ready to get serious about professional freelancing, you need an online portfolio that will showcase the best of your work so you can attract and impress higher-paying clients. Having a portfolio is crucial for getting work. But what kind of portfolio should you have? There are a myriad of ways to display your work online, from listing bare links on your website to using fancy plugins or even social media platforms. Here are a few ideas for you, along with pros and cons so you can decide which one best fits your style and will impress your prospects. And if you’re struggling to break into freelance writing, check out Elna’s course Write Your Way to Your First $1k. It’s her proven framework for freelance writing success. No matter what software you use to manage your website, it’s easy to display your portfolio as a simple set of links. Assuming you already have a website set up, this is the quickest and easiest way to share your work on your website, and the most flexible and customizable if you know a bit of code. Whether you have a huge list of links to share, or are just getting started, a list of links can work to showcase your expertise. You can pick and choose your best work to display, or go ahead and list a wide range of work for your prospects to peruse. In order to keep a big portfolio from being overwhelming, try separating by topic or format. Samar Owais displays lists of links divided by topic, with her latest work showcased at the top. Jenn Mattern and Lori Widmer categorize their links by format (blogging and web content, press releases, newsletters, e-books, etc.). A quick, simple way to create a portfolio on any website, without having to take the time to setup a plugin or an account elsewhere. You maintain ownership and complete control of your portfolio and how it’s displayed. Makes it simple for your prospects to navigate without being overwhelmed or confused. Faster to set up than a plugin. May require some coding knowledge, especially if you want to get fancy with styling your links. You must have your own website, which requires an investment of time and money. Should you use just links? If you already have a website and need to get a portfolio up quickly, adding links to your work is the fastest way to go. And if you’re a bit of a techie and just like having nitty-gritty control over exactly how your portfolio is displayed, this is probably the best option for you. If you’re a WordPress user, you know there are millions of plugins available to expand its core functionality. That goes for plugins for freelancers, too. From plugins to display testimonials or allow your clients to buy packages or schedule consultations right on your website, anything is possible. That includes plenty of plugins to help you display your portfolio, too. As a writer, you might be tempted to look for plugins specifically for writers. But there are a few designed for freelance designers that work well if you usually have images to go with your samples. If most of your samples are blog posts with featured images, or if you want to display your client logos, plugins made for freelance designers can work well for you, too, and add a bit of visual interest to your portfolio. As a writer, you might be tempted to look for plugins specifically for writers. WordPress Portfolio Plugin (WP Portfolio): A plugin that allows you to quickly and easily show off your portfolio visually, including dynamically generated screenshots. OTW Portfolio Light: List all your portfolio items including title, content, client website, short testimonial, and featured image, and enables you to organize them by category. Awesome Filterable Portfolio: Create a lively visual portfolio that’s filterable based on your set criteria (such as topic or format). Great for larger portfolios, or for writers who have multiple specialties. Elna Cain at Innovative Ink uses WP Portfolio to display her portfolio with screenshots. Alicia Rades and Francesca Nicasio use WEBphysiology Portfolio to display their portfolio in an attractive table that includes images of client logos. Create a beautiful, professional-looking portfolio that’s sure to impress your clients. You have control over how your writing samples are displayed. You keep ownership of your portfolio on your own website. Requires a self-hosted WordPress website, so it’s not entirely free. Requires a bit of basic technical knowledge and familiarity with WordPress to install and setup plugins. Some free plugins may display “Powered by…” or other credit links on your portfolio (which may not be a con if you don’t mind it). Should you use a WordPress plugin? If you already have a WordPress website, or are planning to create one (a great choice for freelancers! ), using a WordPress portfolio plugin is an effective and relatively easy way to create a professional-looking, visually interesting portfolio that’s sure to grab your client’s attention. It does require some technical knowledge to set up, but WordPress is absolutely worth learning if you write for online publications. If you’re using WordPress or other blogging software to manage your website, one way to take advantage of your website’s built-in blogging functionality is to post your portfolio links as posts. If you don’t have a blog on your website, posting your work samples as blog posts can be a good way to take advantage of your website’s software. You can help your prospects to navigate through your samples by using categories and tags to separate them by topic or format. Examples: I actually don’t know of any freelance writers who display their portfolios this way. Do you? Please share a link to your portfolio in the comments! Use your existing blogging software to easily add your work samples with no need for plugins or extra code. You retain ownership and control of your portfolio on your own website. You can control the styling of your portfolio by choosing different themes and/or customizing the code. You must use blogging software on your website, which requires some basic technical know-how and an investment of time and resources. May get tricky or awkward to separate out your work samples if you already have a blog on your website. Best used if you’re not blogging. Should you post your samples as blog posts? This seems like a good option if you’re already using blogging software such as WordPress for your website, but don’t plan to have a blog. Remember that you probably won’t be able to post the entire content of your work depending on your agreements with your clients, but just a short excerpt or description and a link to the original should be fine (but you may want to double-check your writing contracts or ask your clients first). With the rise of freelancing, more and more tools designed specifically for freelancers are becoming available. Since displaying a portfolio is one of the key requirements of freelancers, there are several websites and apps out there designed just for that. More and more tools designed specifically for freelancers are becoming available. One such popular platform is Contently. The content marketing company and freelance marketplace provides a tool for freelance writers to add and display their articles and blog posts from around the web. To get started, just sign up to Contently and start adding links to your published pieces (or upload PDFs). It will automatically pull in the titles, descriptions, and images from your links. Quick and easy to set up and update, with no technical expertise required. Simple, modern, minimal design that easy for prospects to navigate. Images are pulled in automatically, making you portfolio visually interesting. Great way to display a large number of samples without overwhelming prospects. Your portfolio is publicly displayed to publishers using Contently to search for writers. You’re handing over ownership and control of your portfolio to Contently. Very few options for styling (just two templates to choose from, with no further customizations available). Some clients may view it as unprofessional compared to owning your own domain and website. Should you use Contently for your portfolio? Contently is a great choice if you need to set something up fast. You can also use it to supplement a smaller portfolio by including many more samples, since you can add unlimited links without it looking cluttered. But you probably don’t want to use it as your sole online portfolio on a permanent basis: You don’t want to lose all your work if Contently disappears or something goes wrong with your account. It’s better to have a portfolio on a platform you own and have control over (i.e., your own website). Looking for a more creative way to share your work? Wendy Parish recently shared on The Write Life for why creating a visual portfolio on Pinterest will boost your writing career. You may think of Pinterest as just a platform for sharing recipes and home decor, but Pinterest lends itself perfectly to creating a freelance portfolio as well. You can create a single board with all your samples, or separate boards for each niche, topic, or audience. Easy way to create a writing portfolio without having a website. Your portfolio will be visually interesting. You’ll need nice-looking images for every sample. You don’t own or control the platform your portfolio is on. Some prospective clients may find it unprofessional if it’s used in lieu of a website portfolio. Should you use Pinterest for your portfolio? Using Pinterest to share your work is an awesome idea, especially if you’re looking to show off your social media expertise, but you’ll want your own professional website in addition to Pinterest. Share Your Portfolio Display Tips! How did you decide to display your portfolio? Do you use one of the methods listed here, or have you found your own unique way to share your work? Share your tips & links in the comments below! And for more tips to get started as a freelance writer, enroll in Elna’s course today! It took me a while to find a way to showcase my work. But, the plug-in I have now is great! Now, I just have to work on not putting every writing piece up! Just the best ones. Thanks for all the different ways to display your work. 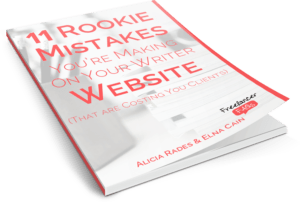 Thanks for having me write for FreelancerFAQs, Elna! I love the plugin you used, too. I’ve just been using bare links myself, but I’m thinking about switching over to a plugin. Just to be clear, when you say to display them as blog posts, you’re saying you should just use your blogging page to layout your portfolio, right? You wouldn’t actually paste your samples, just an excerpt. I believe there are ways in WordPress that you can make your blog post link to an external source when someone clicks on the link, so then it would take you directly to the article. Then if you populate the post with a title, photo, and excerpt, that part should show up on your blog page. I know Bree Brouwer used to do that, but she’s since changed her layout. By the way, anyone know what plugin Elna uses? Thanks, Alicia! Can’t take credit for the Pinterest idea, but I love it too. Yes, you’re right about the blog posts method. I’m sure there’s a plugin that can change links to external automatically, or if you know some basic PHP you could tweak the template. Thanks for including my Contently portfolio in this post, KeriLynn. I agree with your last point about displaying your portfolio somewhere you own. That’s why I also use RSS Aggregator to put a list of my recent posts on my portfolio page on my site and I also publish occasional roundups on my blog. On another note, I’ve recently tried ClearVoice to display my most shared posts. It’s quite attractive and works well. I hadn’t heard of ClearVoice before – going to check it out now! Clippings (https://www.clippings.me/) is also a simple way to show off your portfolio. I didn’t know WordPress had a portfolio plugin! You learn something new every day. I’m going to download the plugin! Thanks. I have a Squarespace account and as a copywriter, I create a lot of social media content for the brands that I work on. I do not manage any of these brands social media pages so I am unable to authorize any tools that pull content directly from the source. Right now I just take screen shots and make a photo album, but I would love it if there was a more effective way of doing this. Any tips or advice for neatly displaying an array of social media posts/videos within a personal portfolio website? Is there a plugin or service out there that people use? I know this is possible with WordPress (I’ve used this plugin before to automatically pull certain posts from Instagram: http://codecanyon.net/item/instagram-feed-for-wordpress-instashow/13004086), plus WordPress has a cool auto-embed feature with oEmbed that’s compatible with Twitter etc., but I’ve never used Squarespace before so I have no idea if they have anything similar. How should a beginner list items in their portfolio when the pieces aren’t accessible online? I have written a couple dozen articles for our local paper, but I don’t believe they are accessible online. Not sure how to cite that in a way that looks legitimate. Any help appreciated, thanks! You can always scan them and then turn them into PDFs. From there you can link to that on your site! Thanks for sharing your informative post and a perfect guideline for a freelance writer to showcase his writings through a portfolio plugin. Thanks for a great post, KeriLynn! The portfolio I have on my website now took the longest to set up out of all of my pages. I wasn’t sure how to showcase it properly and should have found this blog post earlier. I had no idea there were plugins for showcasing a writing portfolio so I’m definitely going to have to check those out! I’m a beginner looking to make a freelance writing portfolio after I submit my first guest post. Should I have a website before I submit a guest post?